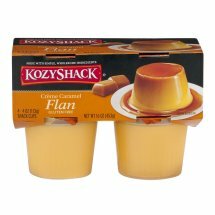 Kozy Shack Flan Creme Caramel - 4 CT.
Made with simple, wholesome ingredients. 4-4 oz (113g) snack cups. Net wt 16 oz (453 g). At Kozy Shack, we believe that simple ingredients make for better-tasting pudding and desserts. We are proud to bring you this traditional, creamy custard with caramel sauce. And because it's made by Kozy Shack, you can be sure it is made with only wholesome, quality ingredients. Flan ingredients: Custard: Reduced Fat Milk, Sugar, Sweetened Condensed Milk (Milk, Sugar), Eggs, contains less than 2% of Carrageenan, Locust Bean Gum, Salt, Natural Flavor, Annatto Extract (Color). Caramel Syrup: (Sugar, Natural Flavor, Xanthan Gum).